I love both of these covers so much, but I think Promise of Shadows wins in the pretty-text-on-black category. The non-linear text with varied letter sizing is more interesting than the more consistent lettering in Tiny Pretty Things. The bigness helps too. It takes up more space, has more presence. Even the choice of the heavier font draws the eye more readily--because it's odd, so the eye catches on it, whereas the eye skips over the "normal" text in TPT. Also, personally, I like the softness of the feathers aesthetically. I think it fills up the background in a way that the glass in TPT doesn't. Maybe a more textured background would set off the pink text better. I have to go with TINY PRETTY THINGS. 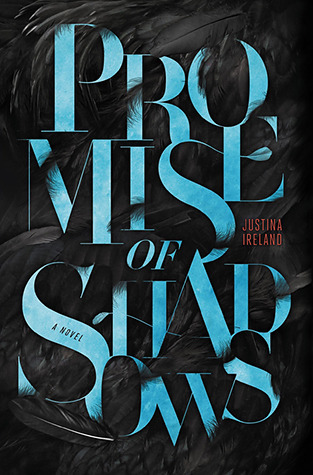 While the cover of PROMISE OF SHADOWS is pretty, it's hard to read. I love the broken and fragmented letters of TINY PRETTY THINGS. Great match up though! Thanks! I do like TPT. It was a hard decision. Promise of Shadows is harder to read since the words are all divided over two lines. On first glance it looks like: PRO MISE OF SHAD OWS. I do like the feathers though. Yeah, I can definitely see that! I love seeing people's different opinions! Thanks! I much prefer Tiny Pretty Things because of the sharpness of the overall look, and I love the comparison and contrast on the sequels cover with the pink and the black, it looks great. I think it's the font that puts me off Promise of Shadows. Bah, still, that's least favourite. It's funny cause the font is what I like. It's cool how people can differ so much about the same thing. I am with you with Promise of Shadows. 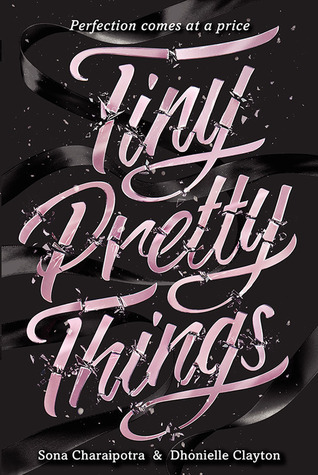 Tiny Pretty Things lettering looks like it's committing suicide. Proving being pretty alone is not enough. I agree with you: I prefer Promise of Shadows! For me it's the colour of the text that makes it pop compared to the light pink of Tiny Pretty Things. The font of Promise of Shadows is more eye-catching too as you said. Same here. I think it's just a little bolder.